As Hahn points out, the term "New Testament" is found six times in the 27 books that would later be referred to as the New Testament of the Bible. While the number may not be a lot, it's significance cannot be overstated. Hahn shows in this chapter that the term "New Testament" according to the Scriptures was not originally the name of a collection of sacred books, but rather "a sacramental bond (21)" that makes understandable (and accessible) the events of Good Friday. Getting the terms right from the beginning is essential. The word "testament" which comes from the Latin is diatheke in Greek and is most often translated into English as "covenant." (The older Douay-Rheims is helpful here in that it translated the Latin novum testamentum as "new testament" and not "new covenant" in the institution narratives. See page 20 in Hahn's book for more on this.) Diatheke is the Greek equivalent to the Hebrew word for "covenant" which is berith. In the Old Testament, "New Testament" or berith chadasha appears only once, and that is in the famous passage found in Jeremiah 31:31. The covenants that God made with his people in the Old Testament form the basic identity of the children of Israel. These covenants were "normally marked by a solemn ritual oath, sealed with a blood sacrifice and. often, with a shared meal (18)." So, when Jeremiah prophesies a new covenant, he notes that it will indeed be new, but it won't be completely different or divorced from the pattern of the earlier covenants. As stated earlier, "new covenant" is found six times in the Christian scriptures. Yet, the only place that Jesus mentions the "new covenant" is during the Last Supper. He doesn't use the term to denote a book, but rather a sacred bond initiated through a sacred meal (21). The beginning of his passion, which will inaugurate the "New Covenant," begins with a sacred passover meal with the apostles. 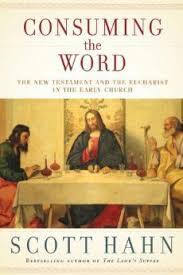 "Thus, in Jesus's only use of the term, we find that 'New Testament' refers not to a text, but to a rite and to the new order brought about by means of that rite (22)." Even when the term "new testament/covenant" is found in the New Testament Letters is appears most often in relation to discussions on liturgy and priestly service (22). Therefore, according to Hahn, it is clear that "when the phrase 'new testament/covenant' appears in the document now known as the New Testament, it appears consistently amid the discussion of sacrificial liturgy and priestly office (23)." Hahn concludes this section by pointing out that the only way a person could make the connection that the crucifixion of Jesus was a sacrifice, instead of simply a public execution, was the offering Jesus made during the Last Supper (24-25). The Last Supper explains the what and the why of the Good Friday death of Jesus. Who is Your Favorite Popular Catholic Author? What do you think are the best editions available for the main Catholic Bible translations in English? (I think I did a post similar to this a few years back, so why not do another one now.) 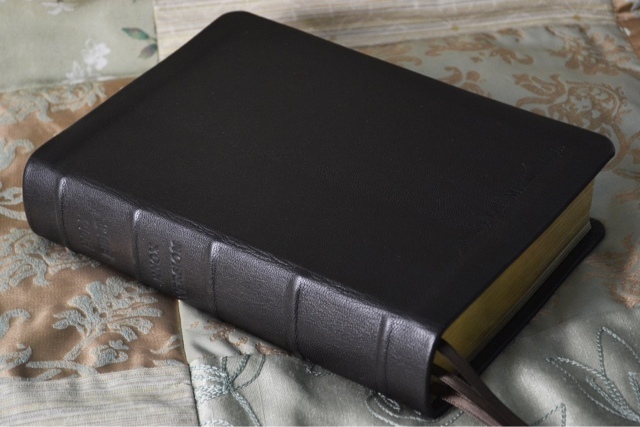 When considering your selections, understand that this can include page format, binding, cover quality, study tools, devotional material, margin space, or pretty much anything you think makes a particular Bible great. There are, of course, some wonderful ecumenical Bibles out there that include the Catholic Deuterocanonicals, however, I am including only Catholic editions here. *Not many options to choose from here. *Even though it is missing cross-references, this edition has some great apologetics materials included, as well as being a joy to read due to it's large print. *I have talked enough about this Bible I think. *All depends on whether you want a classic or more modern looking Bible. * Although this doesn't come with a lot of extras, the page formatting is a very readable, one-column setting. * This one is not easy to get a hold of on this side of the Atlantic, but I was able to get one when I was in Rome a few years back. It has all the NJB notes as well as some additional study materials in the appendix. It is also very compact. (Take note Ignatius Press.) However, I think it only comes in paperback. The first term than Hahn examines is one we are well familiar with, the "New Testament." As he points out, it is "indeed a foundational term (9)." Yet, when asked, most Christians would point to the twenty-seven books of the Christian Bible to describe what is the New Testament. Thus for most, if not all, it is a title of a book. Hahn points out, however, that we don't find the term "New Testament" used to describe this collection of books until the very end of the second century (10). Even into the third century, there was still some discussion as to which books belonged in the "New Testament." Yet, the early Christian's belief system was based on a "New Testament," but it wasn't a book. Now this does not mean that the early Christians didn't reverence the Scriptures, that is something that Hahn is not suggesting at all. He spends the rest of chapter 2 showing how the early Christians "treated as sacred, and thus inviolable" the Scriptures from a very early date (14). 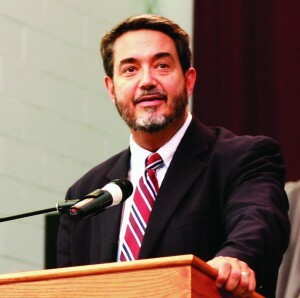 It seems the Hahn, who could have moved immediately on to explaining what the earliest Christians did mean by the term "New Testament," instead chose to spend a few pages reassuring his, perhaps Protestant, readers that the Church of the first four centuries honored and reverenced the Sacred writings, both old and new. He spends a little bit of time looking at the term "canon" and showing that the even some first century Christians, as seen in 2 Peter, already considered some of the Apostolic writings as sacred. To see what the term "New Testament" really meant to first or second century Christians, we will have to wait until chapter 3. "If we seek to understand the vocabulary of our faith as the early Christians understood it, we must be willing to be surprised (16)." Dr. Bergsma on "The Mass as Marriage Supper: Square Brides and Sheepish Grooms in Scripture"
Back in April, I reviewed the newly re-released Douay-Rheims pocket Bible from Baronius Press. Now, I am happy to give a short review of one of the editions of the Douay-Rheims produced by our friends at Saint Benedict Press. 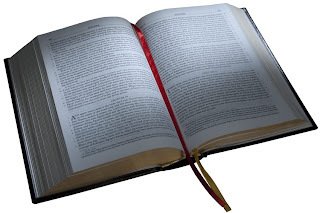 Much like the King James Version, the Douay-Rheims continues to have a strong connection to many of the faithful. However, up until recent years, one could find the KJV in many different editions and attractive styles. That wasn't the case with the venerable Douay-Rheims. Things have been changing over the past decade or so, however, principally due to the work of Baronius Press and, of course, Saint Benedict Press. The edition I have is the burgundy premium ultra-soft one, and I chose to review this one for a reason. For while I think the Baronius Press edition has more of a "classic" feel to it, including a superior binding, which will likely appeal to a certain group of Catholics, I do find the Saint Benedict Press edition, particular in this format, has a more contemporary/up-to-date look and feel to it. I mentioned once in a post, which I couldn't find, that I think one thing that would increase the popularity of the older Douay-Rheims was to be able to find it in a more "hip" binding and presentation. If you ever go to a Christian book store and look at all the KJV offerings, you will know what I am talking about. There are KJV youth Bibles, study Bibles, and other themed Bibles that come in all kinds of different formats, many of which are appealing to youth and young adults. The Douay-Rheims, like many Catholic translations, doesn't have the variety that it deserves. The standard cross-references and annotations as found in most Douay-Rheims (Challoner) edition, the words of Christ in red, updated full color New Testament maps, beautiful pictures depicting the life of Christ., family record and Presentation pages, an historical index, an index to important Catholic apologetic verses, the Mass readings according to the Extraordinary Form, a section of "Beloved Prayers", and a list of the Popes through Benedict XVI. 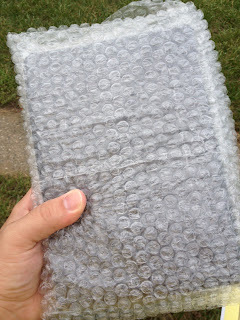 So, as you can see, this medium sized Bible is packed with Bible aids and devotional materials. 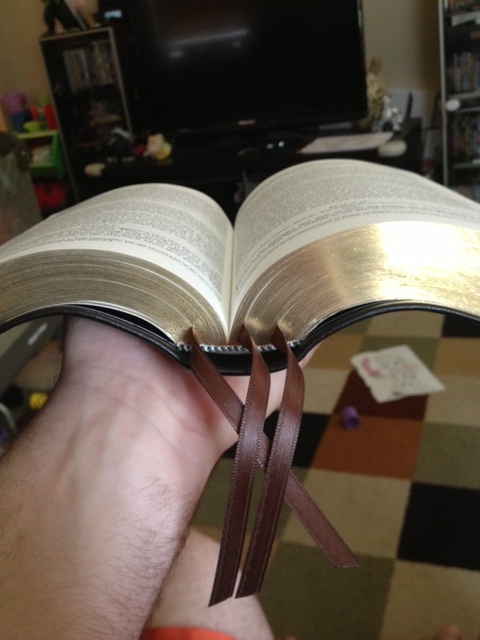 Even with all that is included, I believe the best feature of this Bible is its overall feel and readability. I love the premium ultra-soft cover, which is wonderful to hold and read from. I actually prefer it to the genuine leather editions which SBP produces. And again, this style of cover, with its blind imprinting, gives the Bible an overall contemporary look and feel to it. The readability of the text is also quite good as well. The print on my edition is very dark, including the words of Christ in red, compared to most other Bibles I own. It is actually quite striking. They even left a good inch of space in the margins and at the bottom of each page for personal note taking. In future editions, I would like to see the inclusion of a few Old Testament Bible maps to compliment the New Testament ones. Also, it would be great to see the Douay-Rheims in a single-column page format, much like the Knox Bible from Baronius Press. Overall, however, this is a fun Bible that I think would be perfect for someone who desires the traditional text in a contemporary format. If you are considering purchasing from Saint Benedict Press, if you follow the link below your humble blogger will receive a small percentage of the sale. Grazie! Hahn begins his work with the story of St. Romanus the Melodist, who was a sixth-century composer of homilies in hymn form. He recounts how St. Romanus, like Ezekiel and John the Seer, was commanded to eat a scroll, in this case by the Blessed Virgin Mary. As Saint Jerome remarks: "Unless we eat the open book first, we cannot teach the children of Israel (4)." Truly, you cannot give what you do not own. The New Evangelization needs more lay people who have consumed the Word and are ready to go out into the world proclaiming that Jesus Lives! Yet there is more to this than just a need to understand his written word really well, although that is important. Hahn points out that Romanus, Jerome, Ezekiel, and John all knew that "Salvation comes by way of a covenant-a covenant embodied in a Word, a Word that is made flesh, a Word that is consumed (6)." What it means to "consume the Word" is going to be examined over the coming chapters, particularly in light of the Scriptural and Patristic evidence. But before we are able to do this, it is essential that we understand how the early Christians understood those particularly important theological terms like "covenant," "testament," "liturgy," and "Eucharist." This is the main reason Hahn wrote this book. The need to understand what these basic, though essential, theological terms meant to the sacred authors and the earliest Christians will not only have a profound impact on our own lives, but also on how we spread the Gospel in the 21st Century. 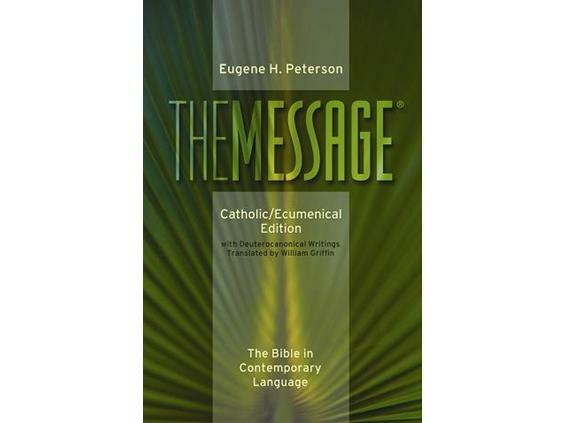 "Our recovery of the newness of that vocabulary-the New Testament, the New Covenant-is especially urgent right now, as the Church embarks upon a New Evangelization (7)." Included in this collection: The Catechism of the Catholic Church, Vatican II Documents, The Revised Standard Version Catholic Edition, Douay-Rheims Bible, The Sources of Catholic Dogma, The Canons and Decrees of the Council of Trent, The Decrees of the Vatican Council (Vatican I-English), The Catechism of the Council of Trent, and the Catholic Lectionary. Brandon Vogt is running a special giveaway which includes one copy of the Catechism collection. Go here to enter. Via The Tablet. Thanks reader John for alerting me to this talk given by Fr. Ashley Beck back in May. This is only an excerpt from the talk, the full version is not yet available as far as I know. "Evelyn Waugh remarks somewhere that in the face of ecclesiastical authority Knox became something of a schoolboy again in the presence of a prefect. This is seen also in relation to his translation of the Bible. While he had been fluent in Greek since childhood, he taught himself Hebrew when he began the work; while he is adamant that the work makes no claims for excellence in biblical scholarship, he was enough of a scholar to want to be aware of nuances in translation - not simply in rendering Jerome's Latin into English, but in understanding Jerome's own work of translation from the original languages - and of textual variants. Consequently the introductions and footnotes in the Knox Bible are important and carefully crafted, like everything else he wrote, and so is the commentary he wrote on the New Testament in 1955. At the same time in the long process of having his text approved by ‘experts' he seems largely to have accepted the suggestions made by others. It is interesting that in some of the works about the Bible which he published after his translation had appeared, he did so alongside a biblical scholar, a Vincentian priest from New Zealand, the confusingly named Fr Ronald Cox - whose pontifical degrees (STL, LSS) are displayed on the frontispieces, as if to give the books academic respectability. Both in relation to theology in general and biblical studies there are perhaps two overall reasons for his reticence. The first is that by and large Knox wrote for laypeople rather than clergy[i], and in Catholic England during his lifetime theology was almost exclusively a clerical discipline. Laypeople who engaged in theological writing of a ‘professional' or academic kind in this period were viewed with a certain amount of reserve: devotional writing for and by laypeople was very different, and prolific[ii]. Not only that, but Knox's shyness and social background, and the work he did as a Catholic priest, meant that he had comparatively few friends and associates among Catholic priests, far less theologians[iii]. The social and intellectual world which he inhabited was not the same. Evelyn Waugh suggests that one can detect this distance in the painful correspondence Knox had with some bishops over his translation of the Bible and his proposed revision of the Manual of Church Prayers in the war years. 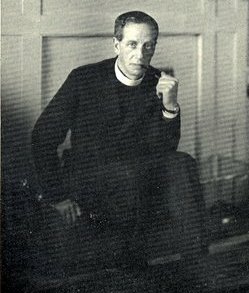 Secondly, both for theology in general and for biblical studies the years of Knox's prime, from the twenties to the early fifties, were arguably in England rather an arid period characterised by caution and fear. In his early writings as an Anglican Knox had mercilessly mocked and poured scorn on the Anglican counterparts of the ‘modernists' and as a Catholic would have little sympathy for the likes of Tyrell and Von Hügel: but the fallout from St Pius X's campaign against them did not sustain an atmosphere conducive to speculative or original theological study. 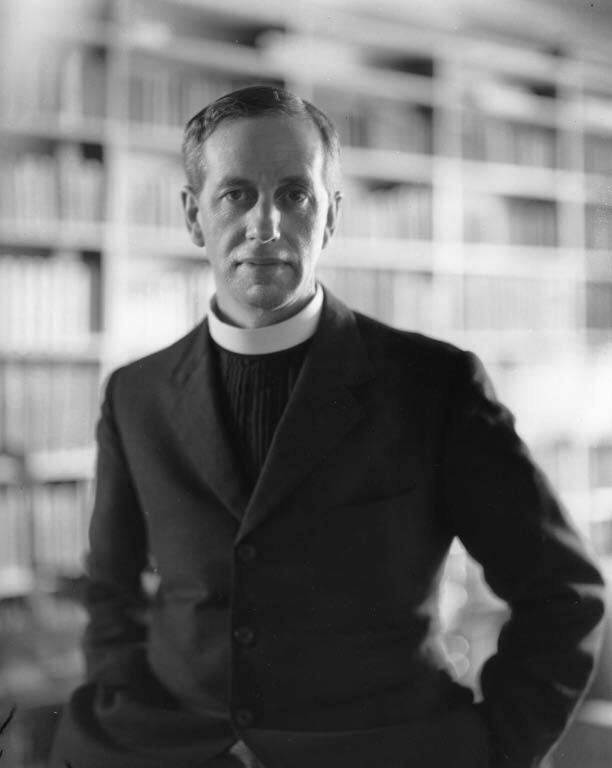 The great turning-point in Catholic biblical studies, the publication of Pius XII's encyclical Divino Afflante Spiritu in 1943 came after Knox's great work on the Bible had got well underway." "Yet we found out that it is through faith in Jesus Christ, not by obeying the law, that a man is justified. We, like anyone else, had to learn to believe in Jesus Christ, so that we might be justified by faith in Christ, not by observance of the law. Observance of the law cannot win acceptance for a single human creature. Through the law, my old self has become dead to the law, so that I may live to God; with Christ I hang upon the cross, and yet I am alive; or rather, not I; it is Christ that lives in me. True, I am living, here and now, this mortal life; but my real life is the faith I have in the Son of God, who loved me, and gave himself for me. I do not spurn the grace of God. If we can be justified through the law, then Christ’s death was needless." Galatians 2:16: The end of this verse refers to Ps. 142.2. "We who know that a person is not justified by works of the law but through faith in Jesus Christ, even we have believed in Christ Jesus that we may be justified by faith in Christ and not by works of the law, because by works of the law no one will be justified. For through the law I died to the law, that I might live for God. I have been crucified with Christ; yet I live, no longer I, but Christ lives in me; insofar as I now live in the flesh, I live by faith in the Son of God who has loved me and given himself up for me. I do not nullify the grace of God; for if justification comes through the law,then Christ died for nothing." * [2:15–21] Following on the series of incidents cited above, Paul’s argument, whether spoken to Cephas at Antioch or only now articulated, is pertinent to the Galatian situation, where believers were having themselves circumcised (Gal 6:12–13) and obeying other aspects of Jewish law (Gal 4:9–10; 5:1–4). He insists that salvation is by faith in Christ, not by works of the law. His teaching on the gospel concerns justification by faith (Gal 2:16) in relation to sin (Gal 2:17), law (Gal 2:19), life in Christ (Gal 2:19–20), and grace (Gal 2:21). * [2:16] No one will be justified: Ps 143:2 is reflected. * [2:17] A minister of sin: literally, “a servant of sin” (cf. Rom 15:8), an agent of sin, one who promotes it. This is possibly a claim by opponents that justification on the basis of faith in Christ makes Christ an abettor of sin when Christians are found to be sinners. Paul denies the conclusion (cf. Rom 6:1–4). * [2:19] Through the law I died to the law: this is variously explained: the law revealed sin (Rom 7:7–9) and led to death and then to belief in Christ; or, the law itself brought the insight that law cannot justify (Gal 2:16; Ps 143:2); or, the “law of Christ” (Gal 6:2) led to abandoning the Mosaic law; or, the law put Christ to death (cf. Gal 3:13) and so provided a way to our salvation, through baptism into Christ, through which we die (crucified with Christ; see Rom 6:6). Cf. also Gal 3:19–25 on the role of the law in reference to salvation. Yesterday, my rebound Baronius Press Knox Bible arrived. 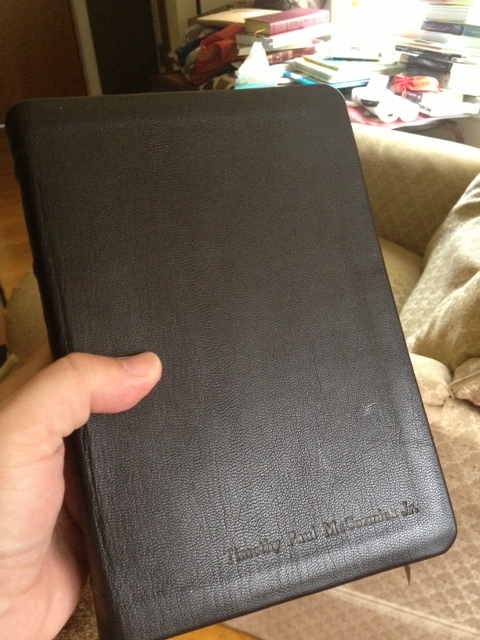 As I mentioned in my initial post about this project, the leather hardcover that the Knox Bible comes in is very good. However, I really wanted to send it off to Leonard's in order that it be covered in premium leather. 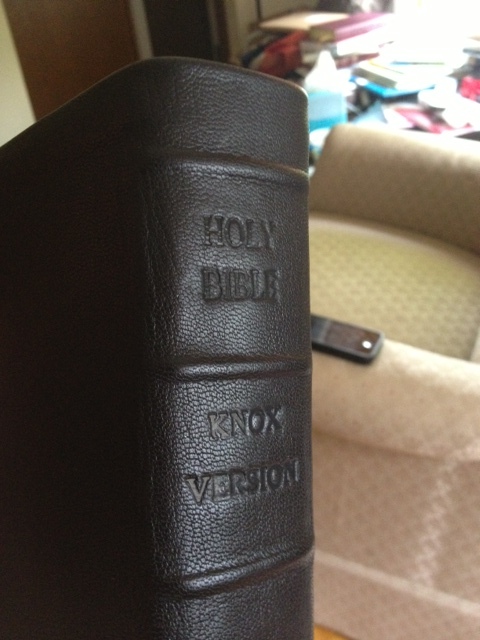 So, below are a series of photos of my newly rebound Knox Bible. Leonard's was great to work with over the past month. Any question I emailed to them was answered within a couple of hours. I will likely post some additional photos in the coming days, along with alerting you as to how the Bible is holding up to daily use over the coming months. Nope, this isn't a "7 Questions" edition unfortunately, but this comes from the Image Catholic Books website and is well worth your reading. Do remember to pick up a copy of Consuming the Word since we will begin our summer book discussion next week. The big inspiration is the Word of God. The Gospel tells us that “the Word was made flesh and dwelt among us.” For Christians, this is the pivotal truth of our faith and the pivotal moment in history. We share in that moment through the incarnate Word, whom we receive in the Eucharist, and the inspired Word, which we have in the Scriptures. My book celebrates both. That inspiration has been welling up inside me for much of my lifetime, and it’s behind everything I do. It gets me out of bed early in the morning, and it keeps me up late at night. More immediately, however, the inspiration that got this book started was actually a chance encounter with a high-school friend of mine. When we were teens, he was Catholic and I was evangelical. I used to challenge him about the Mass. I’d ask: “Where do you find the sacrifice of the Mass in the New Testament?” Eventually he left the Catholic Church and became an evangelical. I, meanwhile, became a Protestant minister before converting to Catholicism. Well, turnabout is fair play. Now that our religious affiliations were reversed, my friend put the question to me: “Where do you find the sacrifice of the Mass in the New Testament?” This book is, in a sense, my response to my friend’s question. I hope I demonstrate, to the satisfaction of scholars as well as lay readers, that the Mass is the New Testament — that the New Testament was a sacrament long before it was a document, and we can see that in the document itself. "And now it happened that he was going into a city called Naim, attended by his disciples and by a great multitude of people. And just as he drew near the gate of the city, a dead man was being carried out to his burial; the only son of his mother, and she was a widow; and a crowd of folk from the city went with her. When the Lord saw her, he had pity on her, and said, Do not weep. Then he went up and put his hand on the bier; and those who were carrying it stood still. And he said, Young man, I say to thee, rise up. And the dead man sat up, and spoke; and Jesus gave him back to his mother. They were all overcome with awe, and said, praising God, A great prophet has risen up among us; God has visited his people. And this story of him was noised abroad throughout the whole of Judaea and all the country round." "Jesus journeyed to a city called Nain, and his disciples and a large crowd accompanied him. As he drew near to the gate of the city, a man who had died was being carried out, the only son of his mother, and she was a widow. A large crowd from the city was with her. When the Lord saw her, he was moved with pity for her and said to her, “Do not weep.” He stepped forward and touched the coffin; at this the bearers halted, and he said, “Young man, I tell you, arise!” The dead man sat up and began to speak, and Jesus gave him to his mother. Fear seized them all, and they glorified God, exclaiming, “A great prophet has arisen in our midst, ” and “God has visited his people.” This report about him spread through the whole of Judea and in all the surrounding region." * [7:11–17] In the previous incident Jesus’ power was displayed for a Gentile whose servant was dying; in this episode it is displayed toward a widowed mother whose only son has already died. Jesus’ power over death prepares for his reply to John’s disciples in Lk 7:22: “the dead are raised.” This resuscitation in alluding to the prophet Elijah’s resurrection of the only son of a widow of Zarephath (1 Kgs 7:8–24) leads to the reaction of the crowd: “A great prophet has arisen in our midst” (Lk 7:16). I am very excited to share with you a photo that Margie from Leonard's sent along to me. I should be receiving this beauty sometime in the next couple of days. Many pictures and reactions to follow. Yes, it is true. 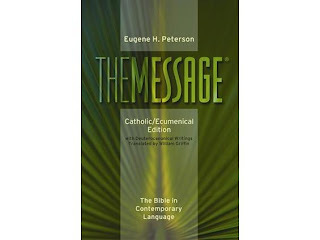 The Message: Catholic/Ecumenical Edition will be available in paperback and hardcover September 1st through ACTA Publications. Thank you to Theophrastus for sending me the link. idiomatic American English and is first and foremost a reader's Bible. trying to say to us today. I am not sure if this edition has received approval from the USCCB, but I will check into it. If you want to get the most up-to-date info about this release, make sure to like their Facebook page here. There is an accompanying book called Selections from The Message that is available on paperback and Kindle which "contains fifteen of the most beloved biblical passes written in contemporary language." This book has Wisdom 6:12-24 on Lady Wisdom, along with some of the most popular passages in the Bible. A note from the publisher, Gregory F. Augustine Pierce of ACTA Publications, is included and explains the genesis of this project. Along with the full edition that will be released in hardcover and paperback on September 1, there will also be a five-disc MP3 Audio version as well. 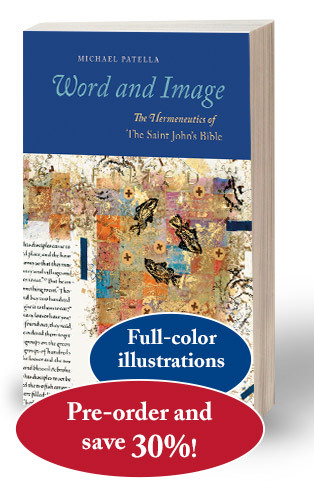 In Word and Image, Michael Patella explores the principles, intentions, and aims of The Saint John's Bible—the first handwritten and hand-illuminated Bible commissioned by a Benedictine abbey since the invention of the printing press. Patella focuses not on how it was made but on how it can be read, viewed, and interpreted in a way that respects biblical inspiration and Christian tradition in our postmodern context. It is a book that is sure to appeal to academics, pastors, teachers, and educated laypersons. Tonight, Wednesday, June 5th at 8 PM EST, Dr. Scott Hahn will host a live web chat at www.imagecatholicbooks.com/livestream to talk about his new book, Consuming the Word. 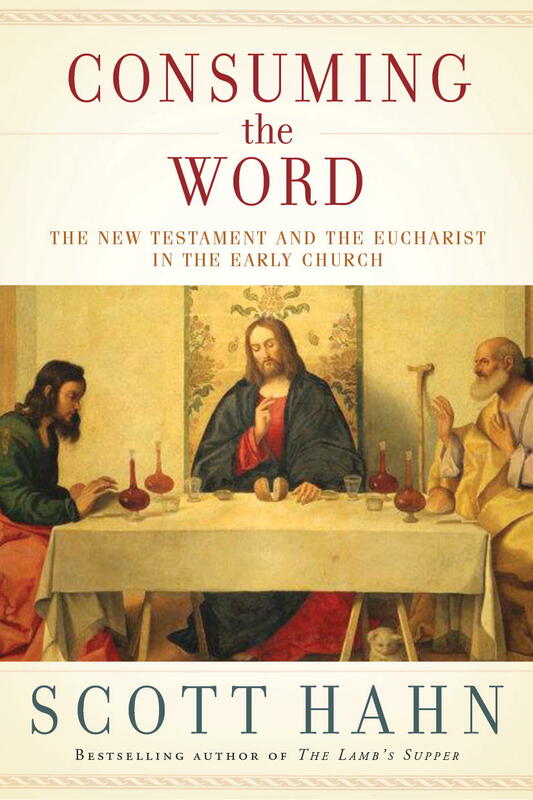 In Consuming the Word: The New Testament and the Eucharist in the Early Church, Dr. Scott Hahn undertakes an examination of some of Christianity's most basic terms to discover what they meant to the sacred authors, the apostolic preachers, and their first hearers. Moreover, at a time when the Church is embarking on a New Evangelization he draws lessons for Christians today to help solidify their understanding of the why it is Catholics do what Catholics do. This should also inspire you to join us in our discussion of this new book, which will begin in a couple weeks. So go get yourself a copy! Yeah, I have failed at doing things like this here on this blog from time to time, I admit it. However, summer is a great time to pick up a good book and have a discussion. So, I am proposing that we spend the summer examining the newly released book Consuming the Word by Scott Hahn. We would accomplish this by reading a chapter or two each week and having a discussion about it here on the blog. I would do the initial post for a particular chapter, giving some brief comments. Hopefully my comments, but more importantly your reading of the text, would then serve as a starting point in order to initiate an active discussion in the comment section of that post. So, who is interested in doing this with me? If you are, RSVP with me in the comment section of this post so that I can see if there is any interest in doing this. Also, let me know if you would consider initiating a particular chapter's discussion by putting together an introductory post. Of course, you need to get a copy of this book before hand. If there is interest, we will begin this summer reading in about two weeks. This review is not meant to be an all-encompassing analysis of the main points Dr. Hahn makes relating the Book of Revelation to the Mass, but rather a note of appreciation for a book that helped to move me in a new way into a greater love of Jesus, the Holy Mass, and the Holy Scriptures. The Lamb's Supper: The Mass as Heaven on Earth is probably the most important book I read during a crucial time of transition in my life. This book was published in 1999 during a time when I was really Catholic in name only. Even though I had gone to Catholic high school and was attending Mass only a few times a month, I knew nothing of my faith and probably cared even less. Yet the Lord began to slowly work in my life, or rather, I began to hear Him who had always been calling me to a greater relationship. From 1999-2001 I was slowly, and I mean slowly, beginning to think about the ramifications about believing in what Christianity was all about. At some point, I realized that if it were true, then I would have to make some tough decisions in life. Because if all this stuff about Jesus rising from the dead and being Lord of the Universe was actually real and true, how could I go on living the life that I was currently living? Somewhere around 2000 I began to attend Mass weekly, and slowly built up the curiosity to actually begin reading books about the faith. Over the course of the next couple years or so, I would find myself spending much of my free time reading Catholic books. Some of the books I was reading were good, others OK, while others didn't really impact me at all. At that point in my journey I really had no idea where to start, so I would just go to the local secular book store and find something that looked interesting in the "Catholic Section" to read. 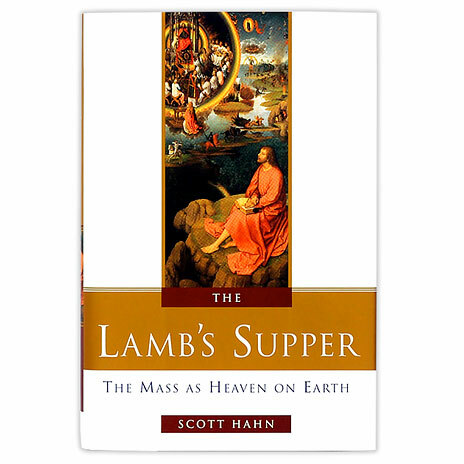 Then, one day, I picked up the book The Lamb's Supper: The Mass as Heaven on Earth by Scott Hahn. I read the dust jacket where it said "With its bizarre imagery, its mystic visions of Heaven, and its end-of-time prophecies, Revelation mirrors the sacrifice and celebration of the Eucharist" and I was hooked. While I was attending Mass weekly at that point, I still hadn't quite figured it out yet, and often times found myself lapsing back into yawning at Mass, as I did as a child. So the whole idea of learning how the Mass related to the ultra-mysterious Book of Revelation, which I wasn't quite yet ready to read for myself, seemed intriguing. In the course of reading The Lamb's Supper I was introduced to two important elements of the faith that I had previously overlooked. First, and foremost, the role that typology plays not only within the Bible itself, but also in interpretation. In chapter two, Dr. Hahn goes over "The Story of Sacrifice" and focuses in on the phrase the "Lamb of God." Now while I was at least familiar with that phrase from hearing it at Mass, I had never really taken the time to investigate why we said it. In this chapter, Dr. Hahn begins by showing how often the phrase is used in the writings of John, then goes back to the Old Testament to show the connection with the Old Testament Temple sacrifices. He writes: "We need to know what the Lamb is, and why we call Him 'Lamb.' To find out, we have to go back in time, almost to the very beginning (16)." That is indeed what he did and all I was left saying was "Wow!" The thread that connects Abraham's sacrificing of Issac on Moriah to the Temple sacrifices at the Jerusalem Temple to the death of Jesus on Calvary made the scriptures come alive for me for the very first time in my life. Truly, learning about typology made the Scriptures exciting! 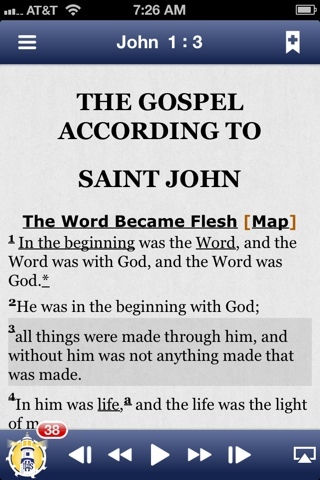 This led me on to looking at other places where typology was important, like John 6. I can honestly say that this "discovery" led me to where I am today, writing a Catholic Bible blog and teaching the Scriptures. Secondly, Dr. Hahn introduced me to the early Church Fathers. At that point, I had never really heard or read anything from them. Sure, I had heard of people like Augustine, but I had no idea that we possessed the writings of Christians as early as the late first and into the second century. Chapter three of The Lamb's Supper is devoted to showing how the early Christians celebrated Mass. As someone who majored in classical history, these early Church writings showed me that the earliest Christians celebrated the Mass in much the same way that we do today. Sure, there were differences and some things had developed over the course of two thousand years, but the basic outline of the Eucharistic Liturgy remained amazingly consistent. He shows how Justin Martyr's description of the Mass in the mid second century is still seen today in its basic outline at every Mass celebrated in a Catholic church. Even many of the words, although spoken in different languages, are remarkably similar as well (37-38). The reality that the Mass was now something that connected me to the past was an eye opener. Knowing that I celebrate the Mass in the same way that my ancestors did, along with those in heaven, made me approach my participation in Mass in a completely new way. And boy, did I never realize how soaked the Mass is in the words and imagery of the Holy Bible. I am sure many of you have known this for a long time, but for me it was like discovering gold in my own back yard. The rest of the book focused on the Book of Revelation with its many symbols and images. He shows how these symbols were understood by the early Christian in a liturgical sense, and not only in an apocalyptic sense, so often distorted by TV preachers. In his conclusion to the chapter on the early Church, Hahn writes: "Keep all of this in mind: the sounds and silences of the Church's first Masses. You'll encounter them again in heaven, when we examine the Book of Revelation more closely. You'll encounter them again in heaven, when you go to Mass next Sunday (39)." In the end, this book set me on a course to buying more books and tapes that Dr. Hahn had produced, as well as other good Catholic biblical scholars. More importantly, however, it helped to spark a deep love for reading the Holy Scriptures and Holy Mass. 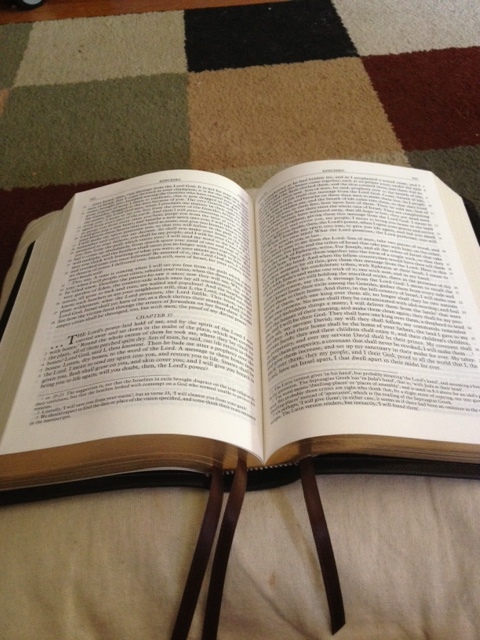 For the first time in my life, the Bible became a living word which began to impact my life on a daily basis. From that point on, I couldn't get enough of reading the Scriptures and listening to audio Bible studies. I also became attracted to going to Mass not only on Sundays, but during the rest of the week. This book is written for a general audience, so I would recommend it to anyone of high school age and over. To read an extended excerpt, you can follow this link. The second half of this year will see the release of two important books by New Testament scholar N.T. Wright. The first, more popular, book will be The Case for Psalms: Why They Are Essential, which will be published by HarperOne in September. You can read an excerpt from this book on the Euangelion blog here. In this excerpt, Wright says, "In particular, I propose in this book that the regular praying and singing of the Psalms is transformative." "This highly anticipated two-book fourth volume in N. T. Wright's magisterial series, Christian Origins and the Question of God, is destined to become the standard reference point on the subject for all serious students of the Bible and theology. The mature summation of a lifetime's study, this landmark book pays a rich tribute to the breadth and depth of the apostle's vision, and offers an unparalleled wealth of detailed insights into his life, times, and enduring impact. 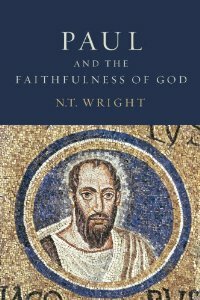 Wright carefully explores the whole context of Paul's thought and activity— Jewish, Greek and Roman, cultural, philosophical, religious, and imperial— and shows how the apostle's worldview and theology enabled him to engage with the many-sided complexities of first-century life that his churches were facing. Wright also provides close and illuminating readings of the letters and other primary sources, along with critical insights into the major twists and turns of exegetical and theological debate in the vast secondary literature. The result is a rounded and profoundly compelling account of the man who became the world's first, and greatest, Christian theologian." So, if you are a fan of N.T. Wright's work, 2013 will certainly not be a disappointment.